Like in real life, hunger is a critical factor for survivability in the game of Minecraft. Players can satisfy their hunger through finding items to eat (like apples) or by crafting simple foods like bread, cakes, or even cookies. Baking wheat-based food items are a common route taken by most players as collecting wheat is an activity any player can take on, even with little resources. Like flour in real life, bread, cake, and cookies items all require wheat as a main ingredient. Many Minecraft players begin a wheat farm on their first or second day. As on most farms, growing wheat can be time-consuming, and can require automation using recipes, like a hopper for automatically harvesting wheat into a chest. Wheat is also extremely useful in breeding cows and mooshrooms, as well as other animals in the game, which supply a significant amount of food. This is a recommended strategy as wheat is a useful resource in Minecraft. Seeds are abundant in most biomes, and seeds can be obtained by breaking weeds you find throughout the biome. However, you need a light source — simply the sun supplemented with torches. Also as in real life, wheat grows best when given bonemeal to act as a fertilizer. Now that you know how to collect the main ingredient of cakes, cookies, and bread in Minecraft, it’s time to explore the individual recipes and crafting process for each food item. Bread is a food item that can be eaten by players in Minecraft to restore hunger points and saturation. It is one of the easiest and most common food sources that is created early in the game because the recipe to make bread only requires 3 wheat stalks. While acquiring the wheat ingredients requires farming, which can be tedious, it also ensures that the player is less vulnerable to the other dangers of the environment in early game-play. For example, it’s much safer for new players to build wheat farms and craft bread as their main food source until they become more powerful to explore the realm. The other great thing about crafting bread is that no furnace or fuel is required to “bake” the bread. All you need is the 3×3 crafting grid which is made available in your inventory after you have successfully made a crafting table. 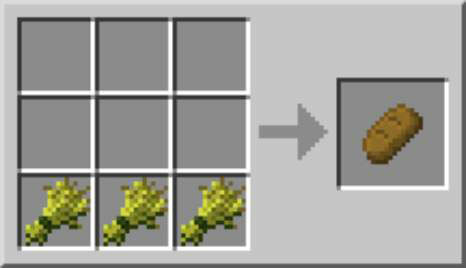 To make bread in Minecraft, place 3 wheat stalks in your crafting grid. These items must be placed in a horizontal row as seen below. Increasingly, players are turning to mushrooms (turned into stew) and carrots as a food source rather than bread and using wheat in other ways. But, if you have a wheat farm setup for recurring harvests, make as much bread as you want. Also, bread can be found in chests or can be obtained by trading with village farmers. Unlike other food items that are consumed when held, cake is a block that is eaten when placed. Each cake consists of six slices, which can be consumed by a single player or a group (as in a real-life celebration). If a single player eats only part of the cake, that player cannot pick up the remaining cake but can return to eat it later. Because cake has multiple slices, it can restore up to 6 Hunger bars (1 bar per slice) but has a low saturation score (so you become hungry again quickly). Cake can also be used as mounting for a TNT cannon. Collect wheat and an egg. 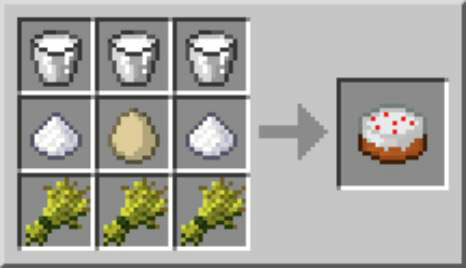 To make a cake in Minecraft, place 3 buckets of milk placed on the top row, a sugar-egg-sugar configuration for the second row, and 3 wheat stalks on the bottom row as seen below. After you complete the recipe, the buckets return to the inventory. Cookies require cocoa beans, which can be found in dungeon chests, which, in turn, are most commonly found in the jungle biomes, or on jungle trees. In a jungle biome, harvesting cocoa beans is easy, and crafting cookies is more advantageous than bread. The total hunger points for cookies is higher (per number of wheat stalks used), but because the saturation is lower, you need to eat more often. Many players consider cookies to be more of a rare treat and a novelty item than a long-term food source. 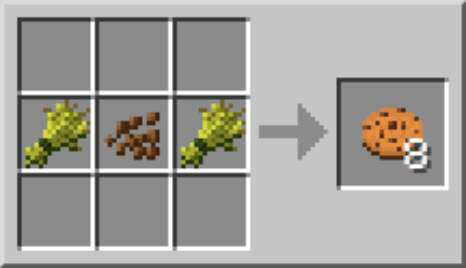 To make cookies in Minecraft, place 2 stalks of wheat on either side of a cocoa bean in a horizontal row resulting in wheat – cocoa bean – what configuration. With the following cookie recipe in place, a player will receive a total of 8 cookies, which can be stacked in your inventory. Now that you know how to make a cake, cookies, and bread in Minecraft, you have officially become an expert baker. Utilize these food items to both satisfy your hunger fatigue and also impress other players. Bringing chocolate chip cookies or decorated cakes when attending a group event or hosting guests on your local server goes a long way towards a good first impression!